Like a sponge, Pushpa soaked in the thoughts and ideals of the political activists to whom she gave shelter during the emergency of 1975, gradually becoming part of the underground opposition. 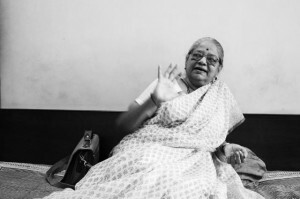 For five decades now, Pushpa Bhave (born 1939) has been part of a series of struggles, starting with the movement aimed at lending voice to the Maharashtrian working class. She has fought for the empowerment of Dalit women, the cause of women head-loaders and sweepers, women beedi (tobacco rolled in leaves to make cigarettes) workers, and of the temple prostitute system. She has been at the forefront of several political struggles, and is campaigning to introduce a bill in parliament to prevent the “dedication” of children to religious sects. Even when she was a student, Pushpa Bhave was aware of the issues she wanted to work with later. She got in touch with leftist theater artistes, and joined the Samyukta Maharashtra movement in 1956, which aimed to lend voice to the aspirations of peasants and the working class. Pushpa later joined the Dalits’ cause, working for the empowerment and education of rural women, and gradually came to participate in the Dalit Panther Movement. She was even jailed for her commitment to the Dalit struggle. Pushpa moved to organizing the Hamal and Mapadi (head-loaders and sweepers) workers’ movement, leading the struggles of the women beedi workers of Nippani, and the devadasi system (ritualized prostitution). During the emergency in 1975, she sheltered many underground political workers, gradually becoming an important member of the underground opposition. She has also worked against the rabidly right-wing Shiv Sena government in Maharashtra-during the 1992 communal riots that followed the demolition of the Babri Masjid, she belligerently challenged the Shiv Sena. Pushpa is a trustee of the Social Gratitude Fund (SGF), which supports activists who do not wish to take funds from international agencies. She is currently campaigning to introduce a bill in parliament to prevent the “dedication” of children to religious sects. Only an adult, she feels, should have that choice, and parents cannot have the right to decide so drastically on behalf of their children.